Our comprehensive understanding of security means we also understand risk. 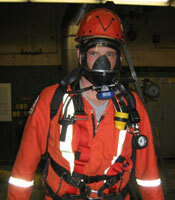 All confined spaces propose some confined space risk when entering and performing work inside. Some of the dangers are oxygen deficiencies, oxygen enrichment, toxic gases and explosive atmospheres. Safety Net Security’s confined space rescue service trains rescue personnel – we are certified to the confined space rescue technician level. Our confined space safety teams are trained to the IFSAC (International Fire Service Accreditation Congress) and Pro Board Standards.